Carefully manufactured for sound, solid connections and trouble-free service. Easily crimped or swaged. Made from electrolytic copper rated for 100% conductivity. Carded 2-pack. Carefully manufactured for sound, solid connections and trouble-free service. Easily crimped or swaged. Made from electrolytic copper rated for 100% conductivity. Carded 2-pack. MIG contact tips are compatible with "Forney" (00306 and 00308), "Tweco", "Binzel" or "Clarke" MIG guns. It is precision machined. 4-pack. For Hobart, Handler 135, 140 (Forney 00355), 175 and 187 (Forney 00356), and Ironman 210 (Forney 00362) and 250 (Forney 00361). 3-pack. 8" (203.2mm) long with 1-3/4" (44.4mm) wide jaw opening. Accepts up to #2 welding cable. Rugged, economical ground clamp for shop maintenance and field work. Good positive connection. Suitable for all farm and shop welders. Commercial-grade battery charger clamps with parrot-style zinc-plated jaws. Includes positive and negative clamps. Accepts up to #2 gauge cable. heavy duty construction and easy grip handles. Heavy-duty, bakelite crowfoot-design electrical receptacle with 2-pole/3-wire grounding for surface mounting. NEMA 10-50. For #2 thru #6 welding cable. Cable splicer for permanently splicing damaged or broken cables and adding additional cable length to existing welding cable leads. 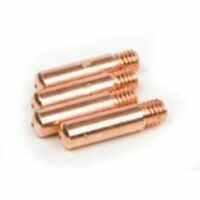 Heavy duty, vinyl pin-type design electrical plug with two brass blades and half pin. 30/50 Amp, 250 Volt capacity. Has extra blade to convert to 30 Amp plug. NEMA 6-30, 6-50. Heavy duty bakelite pin-type design wall electrical receptacle with 2-pole/3-wire grounding for surface mounting. 50 Amp, 125/250V capacity. NEMA 6-50. Heavy duty vinyl crowfoot-design electrical plug with three heavy duty brass blades. Has an extra blade to convert to 30A plug. NEMA 10-50, 10-30. Quick connectors for #1 through #4 welding cable extensions. Heat and oil resistant covers. 8" (203.2mm) long with 2" (50.8mm) jaw opening. Accepts up to #1/0 welding cable. Rugged, versatile, wide jaw ground clamp. Good for most grounding situations. Large contact surface area provides good cable connections and positive grounding. Quick connectors for #1 through #4 welding cable extensions. Heat and oil resistant covers. 7-3/8" (187.3mm) long with 1-1/2" (38.1mm) jaw opening. Accepts up to #2 welding cable. Includes shim stock and wrench. For heavy duty use. Large contact area assures positive grounding. Oval-point screw cable connections make installation easy, assuring good, safe cable connections. Wide grooved jaws for positive ground. Variable speed dial, all ball-bearing motor for long life, head swivels 360 degrees, cuts 7/32" strip which continuously curls out of cutting area for clear line of sight, cuts radius of 5-1/2" and larger. Specs: max watts out 470W, strokes/min 0-2,500 SPM, capacity in: (mild steel) 18 gauge (stainless steel) 20 gauge, replacement parts: left/right blade, center blade, 9.1" long, weighs 5.0 lbs. Stick welder/TIG capable (TIG torch not included); welds 16 gauge up to 5/16"; handles up to 1/8" electrode; 120V input, 90A output. Gasless/flux-core welding only; 120V input, 125A output; welds 24 gauge up to 1/4"; handles .030" wire. Gasless/flux-core welding only. Welds 24-gauge up to 1/4 in. Handles .030 in. wire. Variable speed, all ball-bearing motor for increased power when cutting 5/16" cement fiber siding, head swivels 360 degrees, reversible dual cutting edge, replaceable center and side blades. Specs: max watts out 800W, strokes/min 0-2,500 SPM, 9.1 long, weighs 4.5 lbs. Cuts fiber cement siding up to 5/16" thick with a smooth, fast, and dust-free operation. Based on a 1/2", 6.5-amp motor. Reversible blades machined from solid tool steel. Multi-Process welder: MIG/DC TIG/Stick welder (TIG torch not included). Welds up to 5/16 in. Uses gasless wire .030/.035 in. Solid wire .024/.030 in. Up to 1/8 in. stick electrode. This welder has a duty cycle of 20% @ 230A, 50% @ 150A AC, 20% @ 180A and 35% @ 135A DC; the electroholder cable is 3m 25mm2, the earth clamp cable is 2m 25mm2, both with dense connector. Input cable American Wire Gauge (AWG) 10, 2.5mm. 50A plug. CSA-approved. Cat #00329, wheel & handle kit for "Forney" 00313 & 00314 must be purchased separately. Weight: 116 lbs (52.62Kg). Machine for farming, automotive and small welding repair; it runs off household 115V power and offers a duty cycle of 115A @ 20%, 90A @ 35%, 60A @ 60% and 55A @ 100%; the Euro connect Torch with "Tweco" style consumables makes this machine easy to use; the 8" power cord and 10" MIG gun offers 18 feet of work area; better wire feeding is ensured with our cast aluminum wire drive system and dual geared idler and drive roll with de-spooler; the larger cabinet space allows for easier access to 4" and 8" spools; the improved design offers integrated feet and a torch wrap for cable organization. Specifications: Processes: MIG (GMAW); Flux Cored (FCAW). Input Power: 115V. Amperage Range: 30-140A, DC CV. Wire Diameter Range: .023" - .035". Plate Thickness Range: 24 ga. - 1/4". Weight: 57 lbs. Dimensions: 19" x 9.5" x 16.5". Duty Cycle: 115A, 19.75V @ 20%, 90A, 18.5V @ 35%.